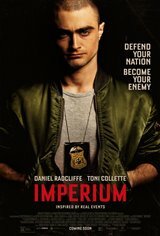 Young, idealistic FBI agent Nate Foster (Daniel Radcliffe) is persuaded by his superior, Angela Zamparo (Toni Collette), to go undercover and join a radical right-wing white supremacist group. After Nate infiltrates the group, the FBI discovers the white supremacists are planning a huge terrorist plot that will endanger the lives of thousands. Meanwhile, Nate is disturbed by what he hears and witnesses within the group of fanatics and becomes fearful for his life as the members grow suspicious of him.